We went to Dominical/Uvita in Costa Rica for 5 weeks in Feb/March 2015. With research on “fun things to do”, I clicked on Uvita 360 for surfing lessons and noticed their participation with Pack for a Purpose and then their link to Passback Soccer. In the past, we have always brought school supplies/clothes when we traveled but finding a place to leave them has been a challenge – Pack for a Purpose made this process a breeze. All e-mails to Uvita 360 were answered promptly and when we arrived Tito brought us to the school so we could deliver the supplies in person which was great fun and a very rewarding experience for us as well. 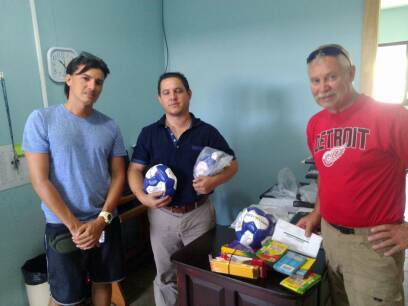 Passback Soccer had sent us 4 soccer balls to bring which we also gave to the school. I have heard there is one airline who allows an “extra free bag” for school supplies/etc.- wouldn’t it be wonderful if ALL airline companies made this same commitment.